An authentic nepali recipe of Mas ko dal, urad lentils. Includes small variation by adding edo or taro root. This is a famous lentil soup of Nepal. It is rich and highly nutritious. Smash ginger by using palm of our hand into the flat side of the knife. No need to smash very hard. Just to crack the ginger will do the job. Rinse the lentils. Do not soak or rinse too much. Put it together with ginger, edo, water, salt and phalamko diyo into a pressure cooker. Bring it upto boil and gently skim off the foam and discard them. Cover the pressure cooker lid and cook in a medium heat until lentils and edo soften, around 10-15 minutes. Stir occasionally so that they don’t stick in the pan. Serve the lentil soup hot. Heat up a small pan. Add the ghee. When the ghee is very hot. Fry the jimboo until it turn black. Immediately pour into the lentils. Stir and boil for another minute. Mas ko dal is also called kalo dal. Kalo means black color and dar means lentils. Edo is called pindalu in Nepali language. Above recipe can be prepared with or without edo. Adding some hing (Aesophetida) also gives richness to this recipe. This recipe is very simple but needs proper observation because lentils can burn anytime if not stirred occasionally. They also cook evenly when cooked in slow flame. Jimboo is basically a type of dried herb from a onion family, which has a similar taste like onions. It is used mostly for the cooking and medicinal purposes. Dry red chili can also be tempered instead of jimboo. Tear few of them before frying into ghee. A sweet corn tastes even better when spiced in a Nepalese style. A must try recipe! Boil the corn with cob in salted water until soft. It may take around 10 minutes. Meanwhile when the corn is boiling, slice the onion and chili. Clean the cilantro (fresh coriander leaves) by separating leaves from the stem. Keep small amount of stems with leaves. Keep them like small florets. In a medium hot vegetable oil, fry the cilantro leaves just for a second until it turns dark green. Remove from the oil immediately and place it on a paper towel or a dry surface. After the corn is boiled, separate the corn from the cob and spread it on the tray. Use a knife to cut the corn from the cob. Gently separate the corn which are sticked together. Heat up a pan, and add ghee. Add onions and cook only until translucent. Add corn, salt and cumin powder. Cook for few minutes while continuously stirring. Wait until it starts making popping sound. Then add sliced chili and stir only for a minute. Turn off the heat. Garnish with fried cilantro before serving. Serve hot. Above recipe is an appetizer or can also be served as a side accompaniment vegetable with any main dish. 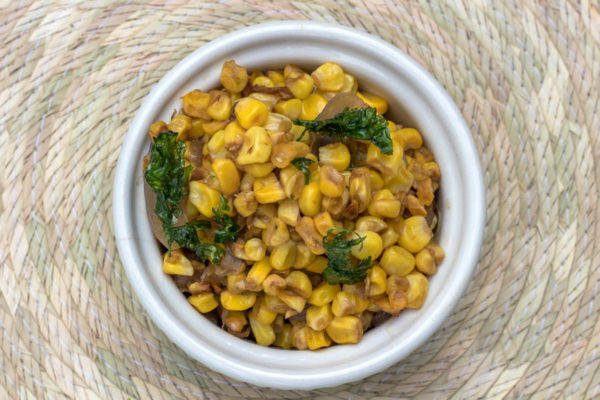 Dudhe makai in Nepali (sweet corn), is the right corn to prepare this dish. The best taste can be obtained from the fresh corn before they reach harvesting season. Any chilis can be used, the only thing we have to remember is that not to cook chili too much. That is why we only add it right before corn is ready to serve. This way chili still remains crunchy and tastes fresh. We can cook the onion and corn separately and mix all the ingredients together in a large bowl, when they are cold. Chopped cilantro can also be used. This way, this recipe turns into a cold version. In Nepali language it could be called as SANDEKO DUDHE MAKAI. 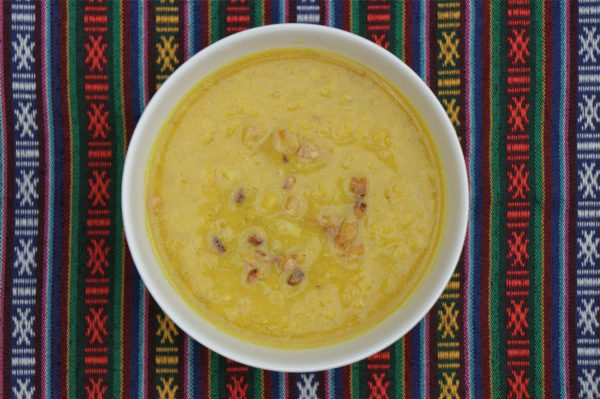 A simple recipe to cook red lentil soup in Nepalese style. Rinse the lentils with clean water. Mix with 5 cups of water, turmeric, salt, and garlic ginger paste. In a pot, bring the lentils to a boiling point and simmer until the lentils are soft and tender. Keep stirring to avoid burning at the bottom while they are simmering. In a separate small pan, heat up the oil or ghee and fry the chopped garlic until golden brown. Pour it to the cooked lentils immediately. This process is generally called tempering. Stir the lentils gently after tempering. Above recipe is a simple recipe to cook Musoor daal. Instead of tempering garlic, we can always play around with other herbs and spices like dry cumin seeds, chopped onion, chopped scallion, green onion, dried chili, cilantro [coriander] etc. Ghee adds richer taste with lentils as compared to oil. Do not burn the lentils as they taste bitter.